If you are the sort of person who buys high tech socks, you might be excused for thinking we have entered some sort of sock golden age. Look at the high tech materials, the comfort zones, the looped fibers next to your skin. Look at the impressive patterns that fun socks have woven into them. Look at how well they deal with moisture and odor. They come in sizes! They have compression qualities to help with blood flow! Of course, none of that is new. None of it is even remotely new. We just have packaging to tell us what features socks have had for hundreds of years. People didn’t have packaging for socks in the 1800s. If they did, the socks would have looked very similar to the socks you wear today. Maybe more white, less colors. A midcentury sock, pictured above, features pretty much everything we think about when we think ‘high tech sock’. A blend of silk, wool and nylon, ribbing for a tight fit, a thinner instep and thicker pads at the toe and heel and a tight fitting top. It even has non functional colors and patterns to help differentiate these areas, like a contemporary sock. Obviously, before the nylon fiber was invented, this same sock would have been made of just wool and silk. Socks don’t have a clear day o’ invention. They are from that time in history when things evolved, they didn’t just hatch, fully formed, like say, the light bulb or the pneumatic tire. Dating the original sock is pretty close to impossible, like dating the first human. Both rely on finding remains that might not have be preserved over the years, and so the record is prone to occasional updating. Socks have a tendancy to get lost and to wear out. They were made of natural fibers, and therefore prone to decomposing over a period of time. 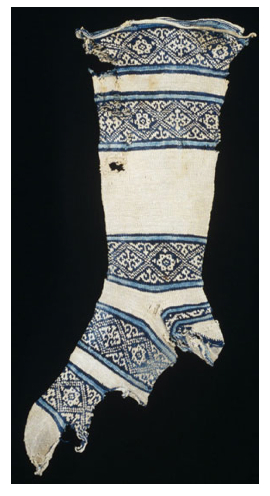 The first socks that we can point to and say: ‘these are definitely socks’ are from sometime around 300-500AD. They are a pleasing red earthen color, and have a handy split for wearing them with sandals. 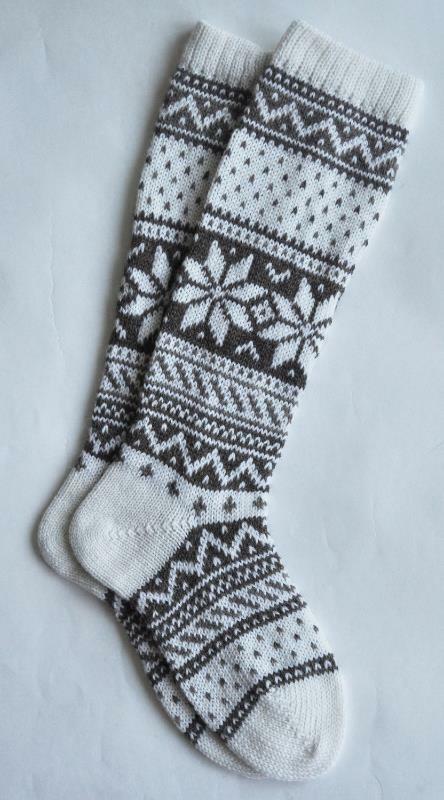 They were created using a precursor to knitting called naalbinding, which was an incredibly time consumptive way to create a sock, or anything else for that matter. I’d wear those socks. Before the Egyptians were rocking the two toe’d naalbinding sock, Greek and Roman folks covered their feet in strips of leather or furry animal skin as a protosock, and bound them at the top. The foot wrap concept was carried into the late 20th century by Nordic armies, who only recently replaced the foot wrap with normal socks. We owe the name sock to the Roman term Soccus (a type of light shoe), which of course is an adaptation of some inpronounceable Greek name for a similar piece of footwear. The modern sock was born with the advent of the sock knitting machine, in the mid-1500s. The machine could crank out six socks in the time that it took to handknit one sock. Remember: no electricity yet. But even before socks were produced on a machine, many of the high tech features and even patterns we associate with today’s wonder socks were available. 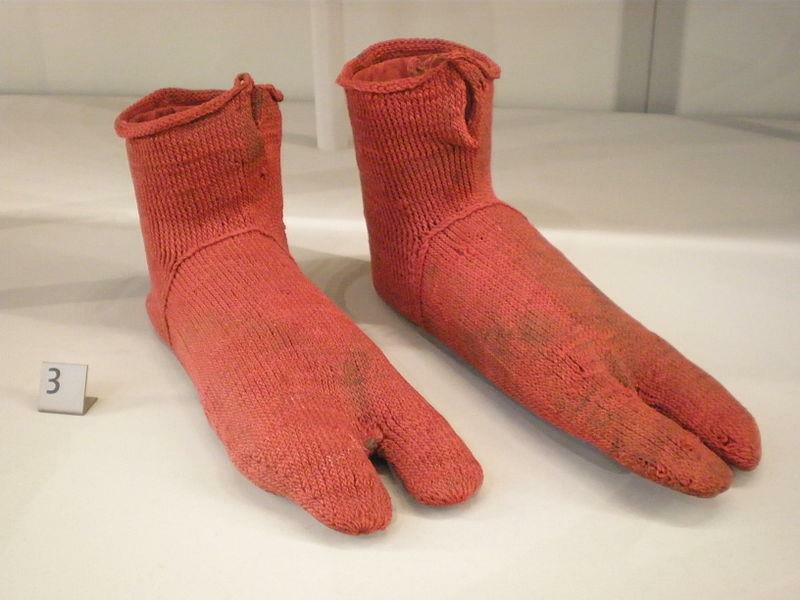 Dig these socks, from the 12th century. Way more advanced than 1980’s tube socks! This particular specimen has a strike against it, though: it’s made of cotton. It was made to be a servicable sock, though, with a replaceable heel. It has a constricted arch, to help with sag, a tapered ankle and extra material around the top to prevent slippage. They remind me of contemporary socks in pattern, as well. Check the new socks below, and compare to the socks above. The impressive thing is that the socks above were done by hand, and have more intricate patterns! For years, cyclists wore thin wool and silk socks. Nylon was absent from cycling apparel until the late 1970s, even though normal people had been sporting nylon since the 1940’s. Dig Eddy’s socks up at the top of the article. Clearly his mom knit those for him. They aren’t sagging, he’s pushed them down to get some air flow. 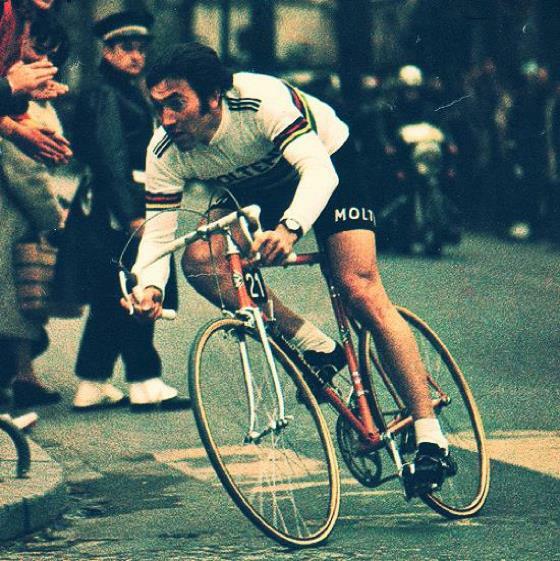 Colored socks were defacto banned from the Pro Peloton until recently. Even today, looking at socks in the Peloton, 97% are white, with maybe some light printing going on. Black socks are few and far between, and look like sore thumbs in the sea of sparkling white socks. 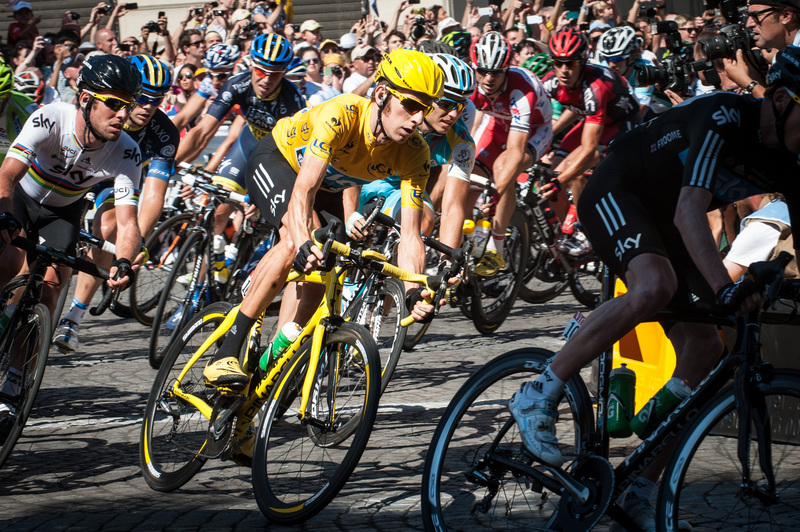 Wiggins looks like an outcast in the 2012 Tour with his black socks. Like someone gave him those to punish him. Personally, I like semi tight socks with dark, nature based colors. The higher the wool content the better. 14 years ago I put on my first pair of Merino wool socks and threw out all of cotton socks shortly thereafter. I strayed from the path occasionally, trying synthetic socks (not absorbent enough, stinky) and cotton blend socks. But today my sock bin is 100 wool based. I would wear 100% wool socks, but they wear too fast, so I stick with wool/nylon blends. A good wool blend sock will outlast whatever shoes you are currently kicking around, unless they are Vasque Montanas, or vintage Scarpas. Look for ones with a high wool content. It’s always listed, and more is always better. Sometimes folks come in and tell me they have found these great wool socks for say, 5 bucks each. And then we look at the packaging, and it’s 5% wool. That’s not a wool sock any more than a frappuccino is a coffee drink. 60% minimum. 75% is better. Here’s a poem by Pablo Neruda about some socks someone made for him. It’s a good, free associating poem that underscores the magical properties of a good pair of socks. Ah yes wool socks are truly great until your well meaning wife roasts them in the dryer. Lost three pairs that way. She felt bad so I bought a new bike. The anguish of it all !!!!!! !